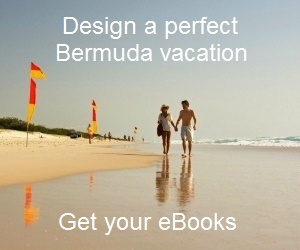 While there are about 34 sandy beaches and coves in Bermuda, some of them are exceptionally good and very popular to both tourists and locals. The ones that are located on Bermuda's south shore have amazing pink sands. The map below shows the location of the most popular beaches in the island. A number corresponds to a beach and you can see its relative location on the map. You can click on a number on the map (with white star background) to get detailed description of the beach along with its pictures, facilities available, how to reach and lot of other information. Snorkel Park is a manmade beach and located at the cruise ship dockyard in Sandys. Somerset Long Bay is located in Somerset Village and has a nature reserve fringing it. Daniel's Head Beach is located at the western coast (also in Sandys). Hog Bay is a secluded small beach in Sandys and not much known to tourists. West Whale Bay Beach in Southampton is great for whale watching during the season (March - April). Church Bay Beach in Southampton is excellent for snorkeling. The most popular and spectacular of all is the Horseshoe Bay Beach in Southampton. It has a trail going east towards other coves and beaches. Chaplin Bay Beach and Jobsons Cove are located east of Horseshoe along the trail and are quite scenic. They are great for relaxing and swimming. A great half a mile long secluded beach is Warwick Long Bay which is also excellent for snorkeling. Astood Cove is a lovely small cove beach with a park above it. It's popular for picnics and weddings. Elbow beach is located in Paget and resembles shape of an elbow. It's very popular with both locals and tourists. You can see reefs close to the shore and this beach too is great for snorkeling. Shelly Bay Beach is ideal for families & kids as it has long stretch of shallow and calm waters, shades, park and other facilities. John Smiths Beach is located in Smiths parish and great for snorkeling at nearby reefs. Tobacco Bay Beach is in St George. It has large limestone rocks jutting out of water. You can see a lot of colorful marine life and corals as you snorkel here. Couple of other beaches are located close by - Achilles Bay and St. Catherine's Beach. Clearwater Beach is located at St David's island. It's a manmade beach but excellent for swimming. It has nice facilities including restrooms and beach bar. 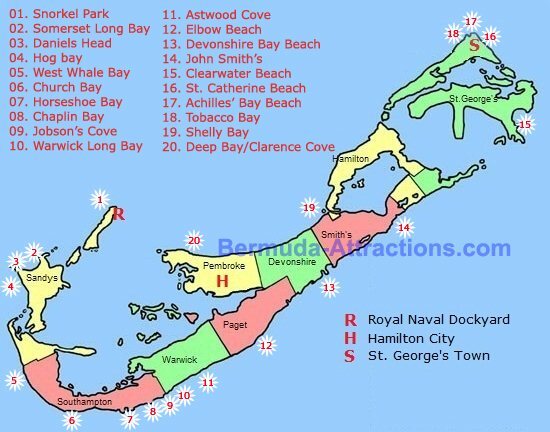 1) Bermuda Maps: Useful maps of Bermuda.